A new mixed-use development is planned for this vacant building at 37-57 Branford Place in Downtown Newark. This wooded lot across from City Hall in Newark is slated to become a mixed-use development. A 83,068 square foot building with five stories is being planned by Broad Hill Partners Urban Renewal LLC. According to a legal notice, the new mixed-income complex is slated to include four studio apartments, 72 one-bedroom apartments, and eight two-bedroom units, in addition to over 9,000 square feet of retail space on the ground floor facing Broad Street. Plus, 42 parking spaces are planned for the rear of the building, which is expected to be LEED certified, according to city records. This photo shows the Old First Church and the former National State Bank Building on Broad Street in Downtown Newark. This photo shows the Van Buren Branch of the Newark Public Library. This photo was taken at Newark City Hall. Hundreds of planes fly over the Passaic River in Newark daily while preparing to land at Newark Liberty International Airport. This photo shows Fulton Street in Downtown Newark at sunrise, with the Midtown Manhattan skyline in the distance. This photo shows the former Science High School on Rector Street in Newark, most of which is currently being demolished to make way for the One Riverview high rise tower. 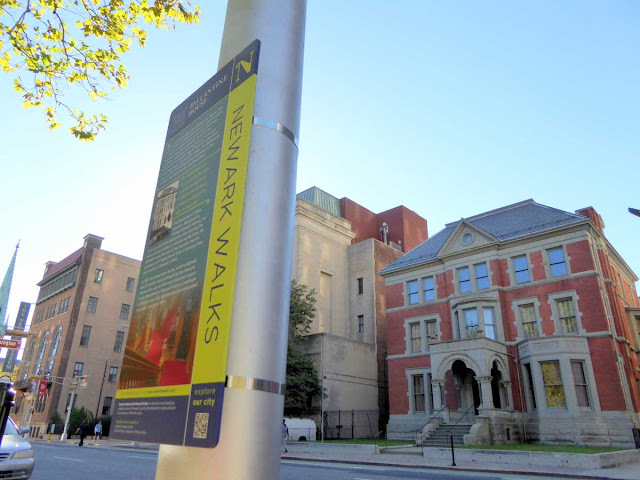 This photo shows the Newark Walks tour stop opposite the Ballantine House in Downtown Newark. This photo shows a view of Newark's South Ward, including Newark Beth Israel Medical Center, from Maplewood. This photo shows Columbia High School in Maplewood as seen from South Mountain Reservation. West Orange, New Jersey: An annual local culinary tradition will return to Essex County next month. The Montclair Rotary Club's Taste of Montclair 2017 will be held on Monday, March 13th, from 5:30pm to 9:00pm, at The Manor, located at 111 Prospect Avenue in West Orange. At least 40 Essex County restaurants, including Bluff City BBQ, Chatni Indian Restaurant, Ahrre's Coffee Roastery, and Gelotti, will serve a variety of cuisine to attendees. All of the food and drink served at the event, which, despite its name, has never been held within the Montclair township limits, will be donated by the participating restaurants. Plus, Jack the Jackal, the mascot of the New Jersey Jackals baseball team, is set to make an appearance. Early bird tickets to Taste of Montclair 2017 start at $64.29. All proceeds will go to the local charities supported by the Montclair Rotary Club, including Toni's Kitchen, the Human Needs Food Pantry, The Salvation Army, S.O.F.I.A, Succeed2Gether, and the Montclair Township Animal Shelter. Click here to learn more about the 2017 event and here to purchase tickets. This photo shows the main overlook at Eagle Rock Reservation in West Orange. Bloomfield, New Jersey: A tract in Bloomfield could soon see several new uses. According to a legal notice, Voglino Properties, LLC, of Wayne, Passaic County, is planning significant modifications for the lot at 5 Wood Street, just off of John F. Kennedy Drive North and Race Street. Currently, a 60-year-old industrial building used by A&R Restaurant Equipment stands at the site, along with a garage. Voglino's plans call for converting the garage into a car wash, and to convert part of the building to be used for automobile detailing and minor repairs. In addition, the notice shows that a new convenience store is also slated to open in the remaining portion of the building. The company is now seeking minor site plan approval and variance approval for the project. The Bloomfield Zoning Board of Adjustment will hear the proposal on Thursday, February 16th at 7:00pm at the township's Municipal Building. This photo shows the sunset at Newark's new Prudential tower. This photo shows Military Park in Downtown Newark at sunset. The Verrazano-Narrows Bridge and the Downtown Newark skyline can be seen from Eagle Rock Reservation in West Orange. This photo shows Newark's Barringer High School. This photo shows a view of Morris County from Caldwell. The Military Park Station on the Newark Light Rail was once called the Broad Street Station. This photo shows the Midtown Manhattan skyline as seen from West Orange. East Orange, New Jersey: Another new development project is planned for the City of East Orange. The project, called Hue Lofts, is slated to rise along North Arlington Avenue near City Hall Plaza and Main Street, at the site of a currently gated and vacant tract opposite the main East Orange Train Station. East Orange Public Information Officer Connie Jackson told Essex County Place that the $70 million project will be developed by Novus Equities, of Jersey City, and will include residential space, live/work spaces for artists, an art gallery, a small amphitheater, and both national and regional retailers. "The developers have committed to hiring at least 20% of employees from East Orange for the entire project - construction to completion", said Jackson. East Orange's mayor, Lester E. Taylor, III, addressed the development during his State of the City speech last week, stating that "this project will be the flagship of our arts and cultural district", and that the live/work spaces will "bring the arts back to our community". Construction is slated to begin in March, and should be completed within 18 to 24 months, according to Jackson. Short Hills, New Jersey: There will soon be a restaurant again at a local golf course. Johnny's on the Green, a restaurant on the premises of the East Orange Golf Course in the Short Hills, closed its doors back in 2012, and the course, located in a remote section of Millburn Township near East Orange's water supply source and the Livingston border, has been without a restaurant in recent years. In 2014, East Orange city officials announced plans to demolish Johnny's on the Green, renovate the 91-year-old course, and build a new 6,000 square foot clubhouse with a restaurant. Although part of the course reopened in 2015, construction continued through 2016 on the new clubhouse, described as "state of the art" by East Orange Mayor Lester E. Taylor, III during his State of the City address last week. Now, the clubhouse is slated to open in late spring of this year. The new restaurant on the property will be called Par 440 Restaurant and Lounge, named for the course's location at 440 Parsonage Hill Road. East Orange Public Information Officer Connie Jackson told Essex County Place that Mario LaVecchia of South Orange's Above Restaurant will operate Par 440. The City of East Orange entered into a license agreement with Team LaVecchia, LLC in May, 2016, according to city records. Irvington, New Jersey: A supermarket that recently opened in Essex County is now seeking to sell alcohol. According to a legal notice from the Irvington Township Zoning Board of Adjustment, Lyons Meat and Produce, Inc., which is registered out of the SuperFresh at 471-479 Lyons Avenue in Irvington, has applied to the board for permission to sell wine and beer within the supermarket at Lyons Plaza near the border of Newark's South Ward. SuperFresh, which is owned by Key Food, opened in the summer of 2016 in the plaza, in the space previously occupied by Pathmark. The board will hold a public hearing regarding the proposal on Tuesday, February 7th at 8:00pm in the Municipal Building's council chambers. This photo shows sunset on Park Avenue in Newark's North Ward.